Quality budget full spectrum grow lights and special spectrum grow lights for under $100 used to be unheard of. 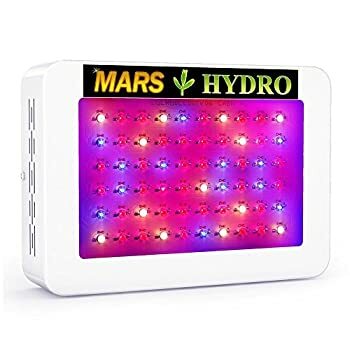 But nowadays LED Grow Light manufacturers are increasingly offering equipment capable of helping you nourish your cannabis even if you’re on a budget. LED grow lights are cost effective, as they consume less electricity but produce the same amount of light intensity. LED grow lights also generate less heat, which means that there is no need to purchase additional equipment to cool down your grow space. The bulbs in LED grow lights last much longer than other indoor lighting for cultivation—LEDs can last over 50,000 hours, while HID bulbs only last up to 12,000 hours. You can read about HID lights vs. LED Grow Lights on our companion site BigBudsGuide. Some full spectrum grow lights are LED grow lights. Full spectrum grow lights are lights which have white bulbs as well as blue and red. The idea is to mimic the “full spectrum” of the sun. Of course, the sun also radiates in the infrared and ultraviolet spectrum so unless your grow lights have infrared (IR) and ultraviolet (UV) bulbs they are not truly full spectrum grow lights. BigBudsGuide also has a few words about wavelength and why Lumens are for Humans. However, now there are an increasing number of inexpensive LED Grow Lights, should you want to give this form of lighting a try. 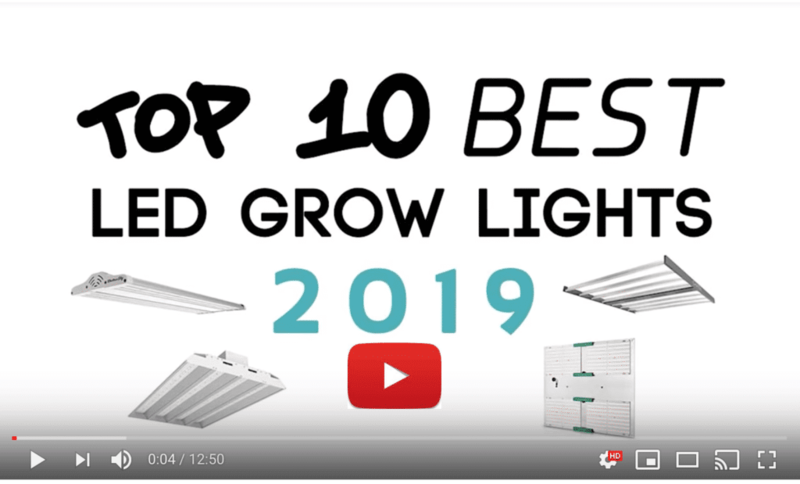 And as LED grow lights continue to gain in popularity and the technology continues to improve even further, it seems likely we’re only going to be seeing better and better LED grow lights available at these lower price points. At the moment, the majority of cheaper lights are best for smaller growing areas. However, along with the small prices, that makes them perfect lights for a beginner or a hobby grower. Someone who’s only looking to grow a few small to medium sized plants, or who wants to get used to growing without spending big. Here is our round up of some of the best LED grow lights for under $100 currently available. The first piece of equipment on our list is one of the most popular LED grow lights for under $100. Although not one of the full spectrum grow lights, the GalaxyHydro 300W LED Grow Light from Roleadro is able to emit 9 different wavelengths of light. This allows your cannabis to receive all the nutrients it needs in every stage of its grow cycle. It covers a 2’ x 2’ space during vegetation and the bulb can last for up to 50,000 hours. This durable light also comes with a two-year warranty and great reviews from loyal customers. Actual energy consumption is around 130W. This light also comes in a slightly larger form factor. Click here for our full review of the larger 300W GalaxyHydro. This LED grow light bulb from TaoTronics may be small, but it’s powerful. This little guy emits three bands of light, ranging from 460 nm to 660 nm of red and blue light, in a 60 degree beam. That means it is technically not a full spectrum grow light. Nevertheless, these wavelengths ensure your marijuana grows healthy and aid in the flowering process. Power consumption is only 36W but the output is equivalent to a 120W HID light! If you’re a beginner looking for a light to take care of one plant, this is a great choice. For added convenience, it also fits a standard E26 light socket. Another great light from Roleadro is their 300 Watt Full Spectrum White LED. These full spectrum grow lights use an all-white LED, which means each diode is utilized to produce a full spectrum of light. This gives a more “sun like” appearance and gives your plants exactly what they need for a full grow cycle. White light also makes viewing the exact health of your plants a bit easier—no blurple hue to everything. This light can cover a 1.5’ x 1.5’ area during vegetation, for an actual power draw of around 126W. It uses high quality 5W chips with 120-degree lenses, deeply penetrating your cannabis plants. It also has two quiet cooling fans to keep heat low and ensure the long life and efficient running of the LED chips. These are full spectrum grow lights as they are usually sold, but do not have much IR or UV specific wavelengths. 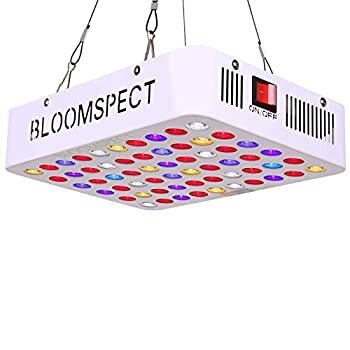 The BLOOMSPECT 300W LED Grow Light provides the same amount of power as other 300W-rated LED Grow Lights but for far less money than most. Not only that but actual electricity consumption is only 132W. Each LED has its own built in reflector, increasing the canopy penetration by up to 150%. Which all means the Bloomspect can cover a 2’x 2’ area during flowering or a 3’x 3’ during vegetation. It also has cooling fans and a built in heatsink. If you think this light sounds too good to be true, the BLOOMSPECT even comes with a 30-day money back guarantee and a three-year warranty—excellent for a light in this price bracket. 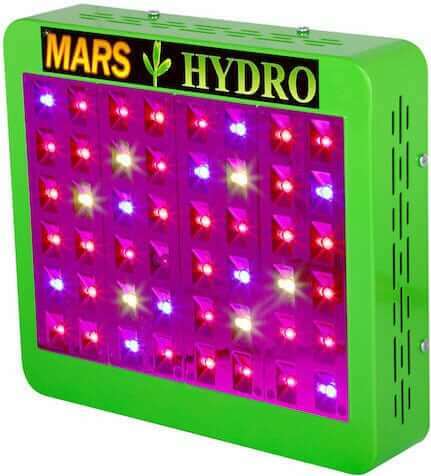 This full spectrum grow light from MarsHydro emits a healthy ratio of red, blue, and white light wavelengths. The LED bulb wavelength selection is specially chosen to only give your plants all the necessary lighting for your plants to thrive. Although inexpensive, this light is still constructed of high quality materials to ensure that your light will last and work efficiently. The light’s 60 5W LEDs, for instance, come from Epistar. MarsHydro claims that this light is the equivalent of a 150W HID. Whatever the case, it only draws 130W at the wall. And when hung at 18″ this will cover a grow space of 2′ x 2′. 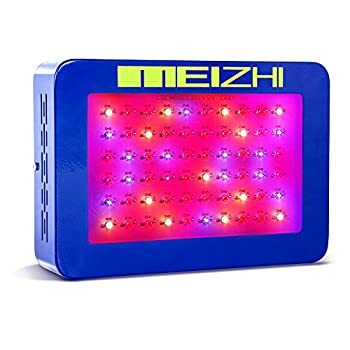 MEIZHI manufactures another high quality 300W LED grow light that is powerful but inexpensive. 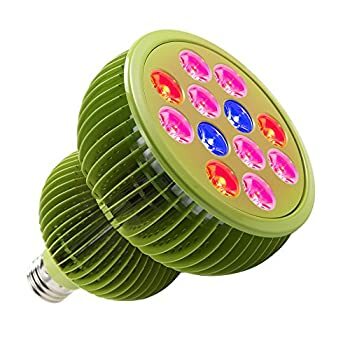 This one is also a full spectrum grow light with Epistar diodes that are blue (430nm-475nm), red (620nm-630nm and 650- 660nm), and white (5500-6500K) making it great for your cannabis to flower. This is equivalent to a 150-watt HID system while running on less power—draws only 130W. You’ll be able to cover a grow area of 2′ x 2′. If you think it looks awfully like the MarsHydro light above, then you won’t be surprised to learn that Meizhi and MarsHydro seem to be two different brand names for the same manufacturer. The difference between this light and the MarsHydro above is that the Meizhi claims lower PAR values and is a bit cheaper. We’re somewhat skeptical about the claims that the secondary optics both spread and intensify the beam—the laws of physics would have something to say about that. But that’s not to say that this isn’t still a slight upgrade on the standard 300W Meizhi. Reflectors should intensify the beam from each LED. And even if it’s not the reflectors achieving a wider spread of light, this is a slightly larger unit, so the footprint will be larger. Stick to the manufacturer’s recommended hanging distances and the light should perform well. 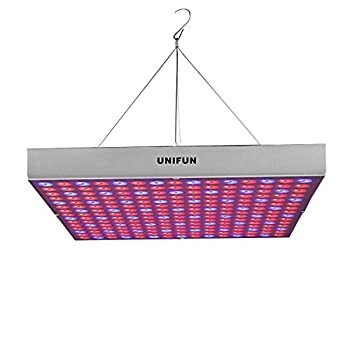 The Unifun 45W Grow Light provides all the benefits of sunlight indoors. Your plants will be able to absorb 90% of the wavelengths being emitted. Unusually for such a cheap light, the spectrum also includes both IR and UV to improve grow times and potency. This makes it a very powerful and efficient light. 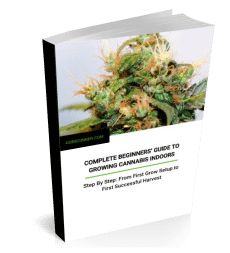 It is compact and transportable, making it perfect for a beginner grower. The Unifun can cover an area of 1.5m², according to the manufacturer, while drawing only 45W. However, the manufacturer doesn’t give much in the way of exact performance details, PAR diagrams, etc. Which is why we recommend this mainly for beginners who want to start with a small, short plant and a very small price tag. 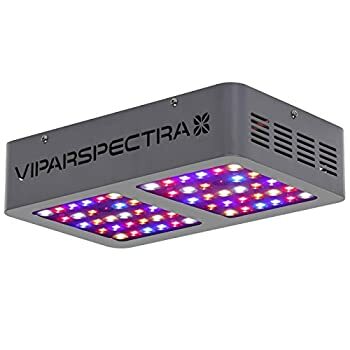 We couldn’t leave out the Viparspectra Reflector Series 300W grow light. It’s a top seller among our readers. You can read about it on our home page, as well as in a full review. So we’ll keep things short here. 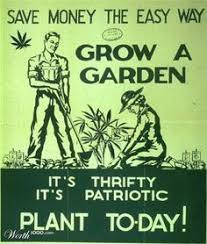 Suffice it to says, this is a great option for a beginner or a hobby grower. 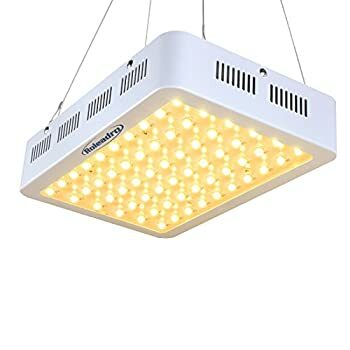 Comparable to a 250W HID light, while consuming only 136W, your 2’ x 2’ grow area will have just the right amount and kinds of light for its needs. The reflectors on the diodes are able to spread out the coverage of the LEDs to make sure every part of your cannabis is covered. And the diodes themselves are high quality Bridgelux and Epiled 5W chips, which last 50,000–100,000 hours. Comes with a 3-year warranty and 30-day satisfaction guarantee. Hopefully you should be able to find a great budget LED grow light from the selection above. Like our readers, we favor the Viparspectra Reflector Series 300W. You get a lot of quality for the small price tag. However, the Taotronics 36W bulb is a great light for small spaces. Like the Viparspectra, it packs a big punch quality-wise for the price tag. We also particularly like the MarsHydro and Roleadro GalaxyHydro lights, which have both proved very popular with our readers. When will you test and review the JCBritw low wattage led grow lights?